We have joined a lot of organizations – Chambers of Commerce, Networking Groups – places where business people gather, meet and create relationships which lead to doing business. The goal is to get known and begin to generate business as quickly as possible. In other words, to get you from Invisibility to Profitability. We follow a pattern when we join a networking organization. In fact, I read that Dr. Ivan Misner, founder of famous networking group, BNI, created a model similar to this, I have just modified it. Dr. Misner’s model is Visibility + Credibility = Profitability. The most common marketing acronym is A.I.D.A. This stands for Attention, Interest, Desire, and Action. This has to do with the time the possible customer first becomes aware of your product, to the time they buy. I want to make it a little more dramatic. So our job is to get you from Invisibility to Profitability. The first step I would like to add is INVISIBILITY. This is where you are when you first step foot into a new atmosphere. Could be a business mixer, a chamber event, opening your doors (either figuratively for an online company or literally for a brick and mortar business) or anywhere that is new to you. People need to see you. They need to get to know you. I use the term Invisibility because I want my clients to be acutely aware that we all have tons of competition and we want to be VISIBLE, not INVISIBLE. Visibility – When everyone begins to learn who you are. First value statements are introduced. You get to share your elevator speeches. When we moved to Sedona, we immediately sponsored the Chamber breakfasts so we could get a speaking role at each of the 4 events each year. This is you waving your flag in the community. Remember to put your best foot forward. A great way to do this is to find other ‘newbies’ and become networking buddies. 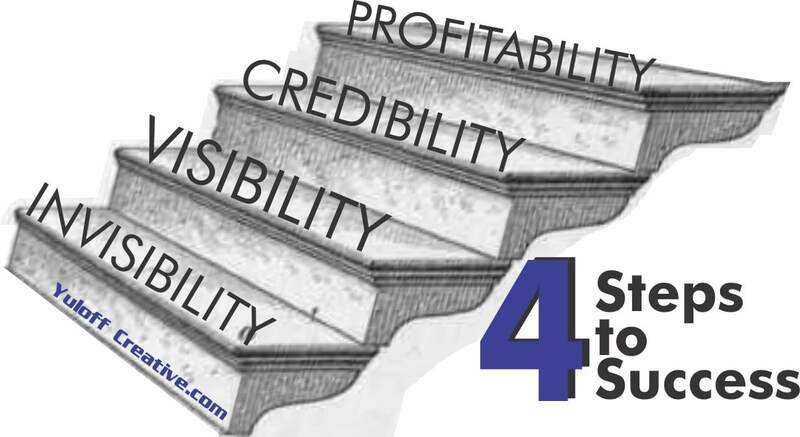 Credibility – When you begin to be seen and “checked out” by the people in your target market. You provide proof of your capability by use of your blog, social media and presentations on video. Profitability – When you develop business relationships, your ability to provide referrals and look for ways to create and provide win-win situations, your sales and therefore, profits go up. This is not a fast process. The creation of your business reputation takes a slow and steady pace. Want some help in the process? 1. Join the business community. Do this by becoming a member of the local Chamber of Commerce and a networking group. 2. Begin to pay attention to the local politics. 3. Blog. It’s a great way people can get to know you prior to hiring you. For instance, you are reading this and hopefully you get an idea of how we can help your business become more successful. 4. Use Video – Facebook Live, and videos uploaded to your YouTube account. This is a great way to create blogs. Shoot a video on the topic first, then transcribe it into your blog. 5. Get involved in groups on social media. Answer questions. Answer questions without being too self-congratulatory or self-promoting. 6. Repurpose your writing. This means you share your blogs to your social media sites once, twice, thrice and more! You are creating a digital asset. It makes COMPLETE sense to use them over and over. 7. Provide value to clients. 8. Find and create opportunities to speak about your industry. 9. Sometimes those opportunities come when you sponsor events. You can be in different levels in different business communities. Keeping track of where you are will help you move forward faster. When we put together marketing plans and work with clients, we take a long look at the status that they hold. We can do the same for you. Head to www.BoxFullOfMarketing.com and we will help you. You get a free marketing assessment and you get a 20-30 minute conversation with Sharyn and Hank to get your marketing more focused. We will get you from Invisibility to Profitability!